Learn how to make chili powder from scratch right now. It's so easy. Make sure the dried poblanos are bendable and don't break (if they do, they are too old). Rip off the stem and make sure the seeds are removed. Tear into small pieces and put into a skillet that is pre-heated on medium high. Let toast for 4 minutes and remove from heat. When cooled, place in a food processor or blender and process to make powder. Add the remaining spices and hit it a few times to blend. It is now ready to put into your chili. This recipe is enough to make a pot of chili using 2 pounds of ground beef. If you are using one pound, just use half of this and put in a glass jar with a tight lid to store. *Dried ancho chiles are spicier and may also be used instead of poblanos. 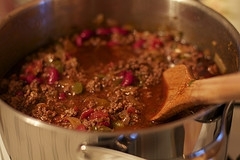 You may also serve the chili with sour cream, sliced jalapeno slices, Frito's or saltines. Fry ground beef in a heavy skillet over medium-high until cooked through. Drain and set aside. In large pot, heat the oil and add 3/4 of the chopped onion and the jalapeno pepper; sautéing until tender. Add the drained ground beef back into the pot and add the remaining ingredients; except the cheese. Simmer for at least 2 hours and refrigerate completely before serving. Just reheat again and add the cheddar cheese on top; sprinkled with chopped onion. NOTE: You may simmer the chili in a crock pot on high for a few hours the night before, and reheat chili again in the slow cooker the next day. Just place the crock in the refrigerator overnight. It's better this way.